Posted on February 3, 2016 | by cookwithwhatyouhave | 6 Comments on Oh Yes! Author (and creator of Communal Table) Adrian Hale not only curates this beautiful site/community but bakes dark, whole grain breads that take me back to my childhood in Germany and loves vegetables as much as I do. I don’t even like marshmallows but the sentiment rings true. I crave vegetables and fresh food as much as the next after the holiday overload (always in fact) but let’s not take the ease and fun out of food and especially, let’s let the judgement go. And with that, let’s have a big bowl of pasta for dinner where the only vegetable in site is the parsley, albeit quite a bit of it. Of course I did want (and had) a salad to go with it. I’ve made this for years but was reminded of it by this recent post from Elizabeth Minchilli in Rome. Bring a large pot of water to a boil. Add more salt (like 2+ tablespoons) than you think necessary. Cook the pasta until al dente. 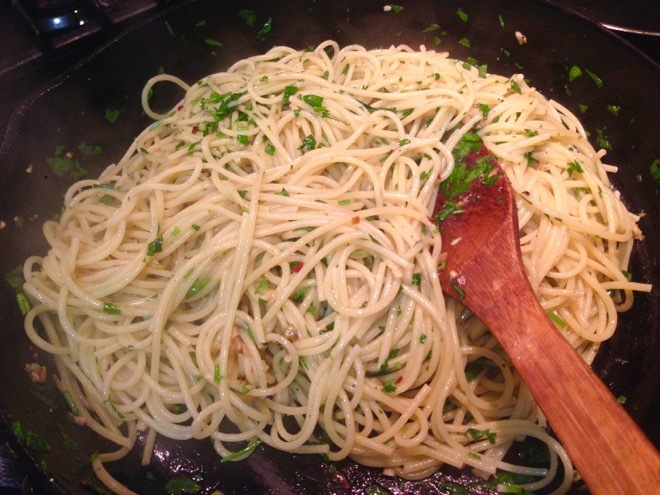 While the spaghetti is cooking heat the olive oil in a large skillet, that will later accommodate all the pasta, over medium heat. Add the garlic and anchovies and stir constantly for about 3 minutes until the garlic is fragrant. Mash the anchovies and garlic up a bit while you stir. Drain the pasta and add to the pan with the garlic and anchovies, stir to coat and cook for a minute or two. Stir in the parsley, freshly ground pepper and a bit more of your best olive oil. Serve at once.